Plumbing lines are designed to carry water and other liquids in one direction. If something is wrong, the water can back-up or flow into your pipes. That can constitute a major problem: sending non-potable water up through your sinks and toilets, and exposing the entire building to toxic materials in the process. Backflow prevention is good for residential properties and essential for commercial properties. 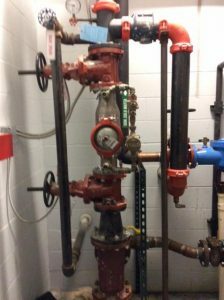 Commercial cross control prevention devices installed and maintained by Embrich Plumbing Co can halt backflow in its tracks. Through yearly maintenance and proper installation, Embrich Plumbing can help protect your employees and customers from a major health hazard, while making sure your commercial space is safe as well. Embrich Plumbing Co offers commercial backflow prevention services in most of Madison County, Illinois and St. Clair County, Illinois. Backflow problems are typically created by forces that are beyond the customer’s control. It often means that the Maryville, IL civic system has a blocked main or flooded sewer system, which can happen during periods of heavy rain or snow. It can also be caused by tree roots interfering with pipes, damage to your sewer line or even the unauthorized use of a fire hydrant somewhere else in the city. None of these are factors that you or your business can influence. But regardless of fault, it is your responsibility to have a system in place to prevent backflow from affecting your property in the first place. A backflow prevention device installed in your business’s sewer main, can make all the difference in the world. It’s a comparatively simple system: angled to allow wastewater to flow out of the building, but snapping shut the moment any water moves back up your pipes. Installing one takes a professional technician, but once it’s in place, you no longer need to concern yourself with factors beyond your control. Your business will stay safe with the plumbing experts at Embrich Plumbing Co who are skilled in repair and maintenance of backflow prevention devices. A backflow prevention device is a key safety and health component of your business. You want it not only installed correctly, but serviced and maintained by a company that knows the difference between commercial needs and residential needs. At Embrich Plumbing Co, we regularly treat commercial preventative backflow issues: installing the devices into businesses that want to avoid backflow problems, then keeping them maintained through regular visits and repairing them promptly so that nothing affects your bottom line (or the health and comfort of your customers and employees). If you need a replacement backflow prevention device for your business, call us today. If you have a reliable system in place, then set up a regular maintenance schedule with our team to make sure it’s always working the way it should.